Pros: It is a value hotel and among the most affordable places to stay on Disney property. 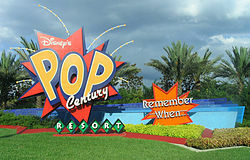 Pop Century has recently been completely renovated with brand new rooms which feature new décor, larger beds and additional USB and electrical outlets for charging convenience. Many of the double beds have been replaced with 1 queen bed and queen murphy bed. This is a huge benefit since all the other traditional rooms at value resorts only have double beds. The resort is family friendly and offers fun theming through the years allowing you the opportunity to reminisce pop culture fun of days gone by. It offers a chance to introduce your kids to the “modern” technology you grew up with. The resort does have a large food court with a good variety of food offerings. The resort is conveniently located next to Art of Animation and features a Generation Bridge across Hourglass Lake providing easy access between the resorts. Located near the ESPN complex, the closest theme park is Hollywood Studios. Throughout the resort you will find interesting facts from each decade. For those who like to dance, you have a chance to get your groove on and do the twist in the lobby each morning, or the hustle each evening in the food court. Cons: It is a value hotel and the room is smaller than the moderate and deluxe resort rooms. This resort is priced slightly higher than the All Star resorts. Since this resort is one of the most affordable resorts, they often book up quickly making this a challenging resort to find availability in for a last minute trip to Disney. It also does not have a full service restaurant.